The brown pelican's image adorns postage stamps across the Americas, from Bermuda and Belize to Venezuela and St. Vincent and the Grenadines. It is Louisiana's state bird and the national bird for Turks and Caicos Islands. With its dark plumage and distinct feeding methods, the brown pelican sets itself apart from seven other pelican species. 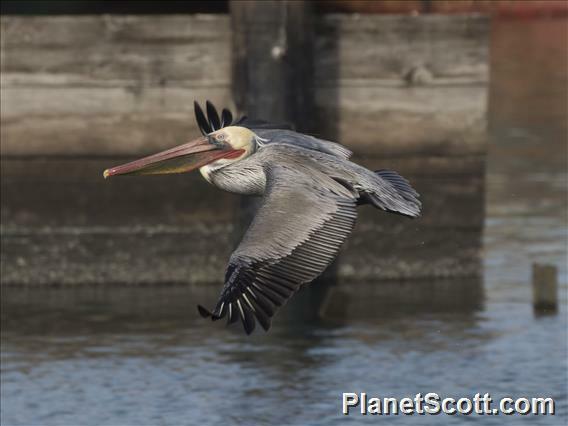 Aside from being one of the smaller pelican species, the brown pelican is the only one that is known to dive and dine. Most pelican species feed by corralling fish into shallow waters through a group chase before scooping them up with their large beaks. Brown pelicans have their own distinct method: once they spot light reflecting off the scales of fish, they plunge into the water from heights of up to 70 feet where they scoop up fish, drain water through their beaks and tip their heads back to swallow (MarineBio.org: Brown Pelican, Pelecanus occidentalis, 2010 ). Air sacs beneath their skin protect them from injury when they hit the water (read more: and . The air sacs are also part of what helps these birds fly. Their body length measures 48 inches (1.2 m) on average, which is about the height of a nine-year old child. Yet their weight rarely exceeds 12 lbs (1.4 kg). The trick to keeping such a large bird aloft is not just a long wingspan, but a body made light through air sacs .